Dodecahedron Books: Postmedia – Investor Battle Over? The news of July 7, 2016 seems to imply that the showdown is over, and the fund from the Toronto suburbs (Canso) came out as the clear winner over the rough and tumble New Yorkers (Goldentree). These high finance deals can be tricky to interpret, but near as I can tell, the deal goes something like this. First Lien Debt: Canso is owed $313 million, @ 8.25% interest, due August 2017. Second Lien Debt: Goldentree is owed $363 million, @ 12.5% interest, due in 2018. Most ($268 million) Goldentree debt is converted to shares in Postmedia. They now become majority shareholders, with current shareholder value being diluted accordingly. It seems to me that some money is missing here; only $268 million of the second lien debt has been converted to shares, so $95 million seems to be unaccounted for, in these reports. However, the deal is also supposed to bring in $110 million in new capital, in the form of second lien notes to come due in 2023, from New Jersey Chatham Asset Management. It beats me why they would want to throw money at Postmedia – perhaps some sort of swap with Goldentree is involved, that covers the missing $95 million. That’s just a guess, though. Mind you, Goldentree is reported to be “not involved at all” in the July 8 story in the Globe and Mail. The Globe and Mail story also notes that “the plan of arrangement allows Postmedia to avoid the prospect of declaring insolvency and filing for creditor protection under the weight of interest payments, at least for the foreseeable future”. 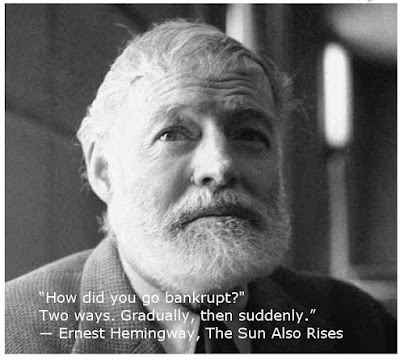 “How did you go bankrupt?" If this deal holds up (it is voted on in August) Postmedia seems to have bought a bit more time for Hemingway’s “gradually”. By the way, my Postmedia paper didn’t arrive at the door last Saturday. I didn’t bother phoning about it – after all, current news of the Turkish attempted coup was available on the web, anyway. Twitter was very busy with stories about Turkey, for example. I kind of missed the Saturday and Sunday New York Times crossword puzzles, though, which they carry. 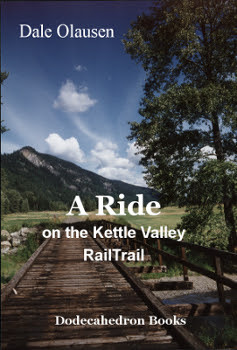 While these big investment firms fight it out, you might want to consider an exciting biking trip on the Kettle Valley rail-trail. It’s the adventure of a lifetime, even more fun than big business. And if you are in big business, it’s a nice stress reducer.